Over the next few weeks, we'll be celebrating just how easy it is to get your eat on in Rosslyn. With more than 65 restaurants, cafés and markets within a 1/4 square mile and an active food truck scene, we have lots of great choices, and it's only getting better. As new buildings come online and more people and businesses move in, their presence only fuels the neighborhood's restaurant scene, motivating new restaurants and cafés to come here. Some of us at the Rosslyn BID spend much of our work life learning about, meeting with and helping to promote Rosslyn restaurants, both those that are here and those that are coming here or thinking about coming here. Trust us: The Rosslyn restaurant scene is good, and it's only going to get better. If you live or work here, you have a lot of delicious dining to look forward to. To kick off our "All Things Dining" extravaganza, we thought we'd start with an exposé on breakfast and lunch. We all need to eat it and we all want something good. 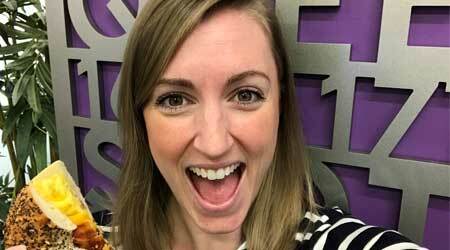 Read on to find out where we eat when we're hungry at the office! Urban Planning and Design Manager Doug is quite an athlete. He's always cycling superhuman distances (a typical ride for him is 60-100 miles!) and needs good, healthy fuel to keep himself energized. 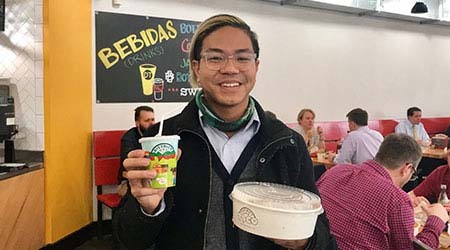 Last week, he chose a made-to-order sweet potato noodle bowl from the Brown Bag with spinach, tomatoes, corn, grilled chicken and Pad Thai sauce. Delicious eats, he said, that packed a nutritional punch. The sweet potato noodles are seasonal, so you'll want to try them over the next couple of months. Highly recommended! Learn more. Business Development Director Michelle is a super-busy mom of three who is often the first to arrive in the morning. She regularly works out at our building's fitness center before work and is usually rushing off here or there for meetings during the day. Last week, when she needed some fuel on a cold day, she enjoyed a comforting cheesesteak from Capriotti's with fried onions and sweet peppers. She knows it may be her last meal of the day! She ordered it online so she could avoid the wait. Learn more. 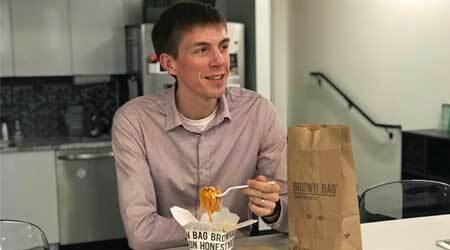 Social Media Specialist Justin is an avowed foodie who loves eating out and indulging in spicy fare. But as someone who tends to fall victim to an afternoon food coma, he prefers a light lunch. Last week he opted for the economical and delicious Kid's Meal at District Taco. You don't have to be a kid to order one! It includes a small drink, a taco (or quesadilla) and beans and rice. Of course, Justin adds jalepeños and slathers everything with the hottest salsa possible. It makes him very happy, indeed. Learn more. With a hectic schedule similar to Michelle's, Communications Director Maureen spends a lot of time rushing off to meetings or dialing in to conference calls. When she doesn't have time to make breakfast, she pops upstairs to Kenny's Café for one of their fresh, made-to-order breakfast sandwiches. Yesterday, she had an everything bagel with ham, egg and cheese. Delicious and satisfying! Drop by their local café at 1911 N. Fort Myer, or visit their catering website here. An enthusiastic runner and cyclist, the BID's writer, Mary, craves veggies the way some people crave chocolate. 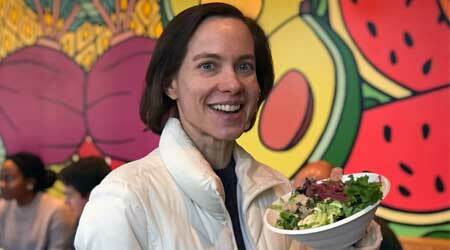 So when the veggie-focused sweetgreen and The Little Beet moved to Rosslyn last year, she was thrilled by the healthy eating prospects. Although she's also a big fan of sweetgreen's Rad Thai over greens, last week she ordered The Little Beet's Brussel Hustle. It includes chicken, shaved Brussels sprouts, super seeds, pickled onion and Pecorino cheese topped with their to-die-for lemon dressing. Learn more. Disagree with our choices? Know of something better? Email us and let us know what you think! Photo at top: A bustling food truck scene enhances Rosslyn's diverse dining landscape.